ColorCheck is the only industry toolset for color accuracy, consistency, and conformance to standards that can be validated to print buyers. With ColorCheck, users benefit from having confidence in meeting customer brand color needs, peace of mind from knowing output consistency before printing, and have site-wide control of print output quality across devices for all media profiles. In addition, in-product indicators reduce waste and save both ink and media with alerts built into the RIP-Queue interface, notifying the user when to perform printer maintenance. 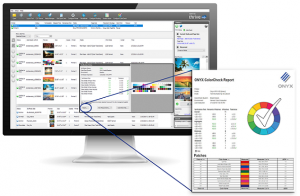 ColorCheck is part of ONYX 18 software, the company’s recent version release, and is an integrated module in ONYX Thrive, accessible with an ONYX Advantage Gold subscription. Current ONYX users can request a key update and all other customers can gain access through a license purchase. The ONYX Advantage subscription program gives ONYX software users a quick and easy way to keep their software current and secure their investment. Customers that are not ONYX Advantage subscribers should contact their local Authorized ONYX reseller or visit onyxgfx.com for more information.